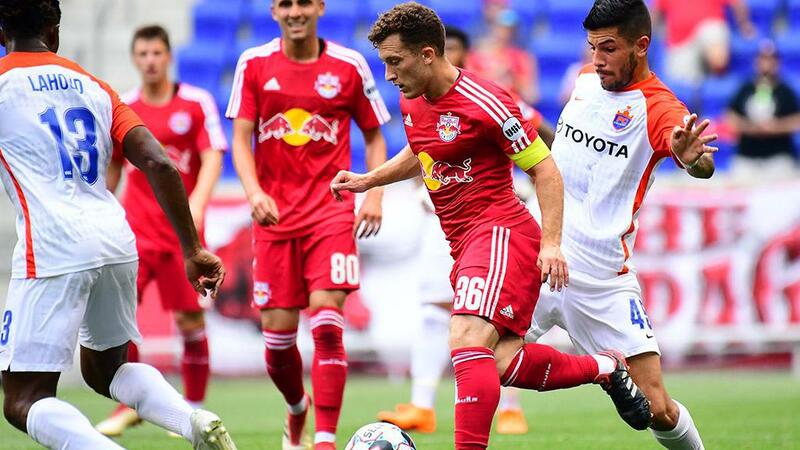 HARRISON, N.J. – FC Cincinnati rallied from a halftime deficit to take a 2-1 victory as a missed penalty kick proved costly for the New York Red Bulls II on Saturday afternoon at Red Bull Arena. The Red Bulls II struck in just the seventh minute as the hosts turned over possession in the attacking third, which allowed Jared Stroud to break into the penalty area and center for Amando Moreno to finish to the left corner of the net. The hosts went close to adding to their lead 11 minutes later as Stroud and Moreno again linked up, with Moreno’s flicked header going just high, while Andrew Tinari slid a shot just wide of the right post just past the half-hour mark. Cincinnati came into the game more toward the end of the first half, and that momentum continued into the second half, but it was New York that threatened on the hour-mark as Moreno had a shot blocked by FCC defender Justin Hoyte before Chris Lema had his shot turned wide by goalkeeper Evan Newton. From the ensuing corner kick, a low shot from the top of the penalty area by Lucas Stauffer was handled in the area by FCC defender Paddy Barrett, resulting in a penalty kick that Brian White shot over the crossbar. Cincinnati made New York pay for the miss almost immediately as Emmanuel Ledesma floated a curled finish from the right side of the penalty area into the left corner of the net over Levene, and then took the lead with 13 minutes to go as poor clearance by the Red Bulls II defense saw the ball drop to König for a finish to the left corner. The visitors looked to add to their lead late on but didn’t need an insurance goal as FCC ended up seeing out an important bounce-back victory. 1. Cincinnati finally made its experience tell in the second half to earn an important three points that returned the side to the top of the Eastern Conference standings with Louisville City FC on a bye this weekend. FCC wasn’t up to speed early in the contest, and could be considered fortunate after New York’s Brian White shot over the crossbar from the penalty spot in a moment that could have dented FCC’s second-half momentum, but the visitors capitalized on that let-off to get a beautiful goal by Emmanuel Ledesma to level soon after and then a clinical finish from Danni König to earn victory. 2. New York’s pressure repeatedly caused mistakes from Cincinnati in its own half, but after taking the lead through Amando Moreno’s seventh-minute goal the hosts missed out on other opportunities that would have given the Red Bulls II a solid lead. From Moreno’s flicked header that went just over the crossbar, to Andrew Tinari appearing to get caught in two minds on a good cutback by Brian White, to Niko de Vera blazing over after Jared Stroud produced a dangerous low ball through the area, New York’s inability to capitalize on their rattled opponents left the door open for Cincinnati’s comeback. 3. Cincinnati’s first victory on the road against the Red Bulls II in its history continued the club’s strong away form this season, which has seen Cincinnati record five wins in seven games on the road this season. Those five wins have surpassed the club’s road victory total from the 2017 regular season, when the club was just 4-8-4 away from Nippert Stadium. Maintaining that level of consistency on the road is going to allow FCC to remain in the hunt for top spot throughout the season as the club looks for the first silverware in its history. Michael Lahoud, FC Cincinnati – Lahoud helped Cincinnati regain control of the midfield, winning all eight of his duels while completing 47 of 57 passes to turn the tide in the contest.